Increasing automation in the U.S. workplace will enable some occupations to evolve and even benefit from greater technological reliance over the next decade, although some jobs — especially those which disproportionately employ women or low-skilled workers — could be more susceptible to being automated in the short-term, according to industry experts and lawmakers. Experts said that increasing reliance on automation and associated technologies, such as artificial intelligence and robots, will lead to employers hiring more innovative workers and evolving concepts about the nature of paid work. “The greatest momentum now with automation is actually in a lot of occupations that women are disproportionately employed in,” Molly Kinder, who specializes in workforce development at the Washington-based think tank New America, said in a Thursday interview. She pointed to positions like cashiers and administrative assistants as examples of vulnerable jobs, and studies conducted earlier this year by New America in Indianapolis and Phoenix found that women were more likely than men to be employed in positions that are susceptible to being automated. 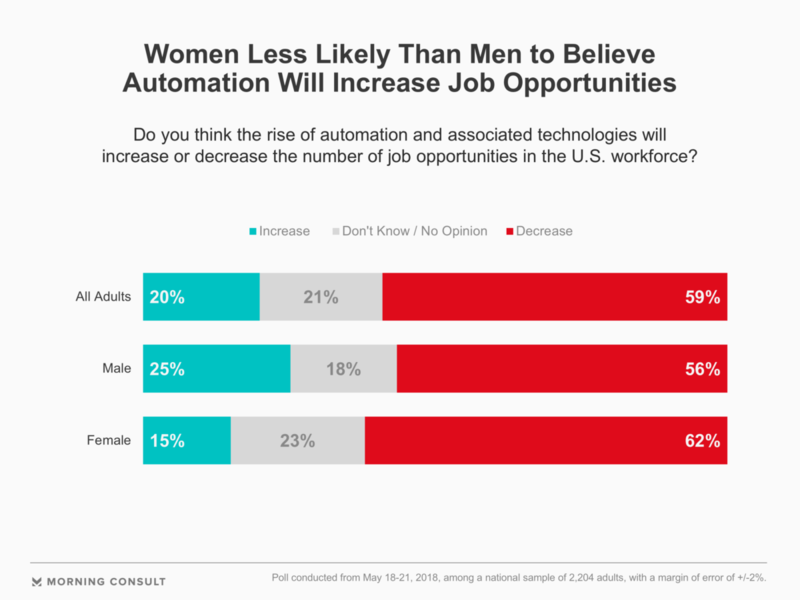 A nationwide poll conducted May 18-21 found that 15 percent of women believe automation and associated technologies would increase job opportunities, while 62 percent said it would decrease job options. The same Morning Consult survey found that 25 percent of men believed the number of available job opportunities would increase, while 56 percent said increased automation would limit the number of available jobs. The online survey of 2,204 U.S. adults has a margin of error of plus or minus 2 percentage points. “When we think about what the jobs of the future will hold, the safest areas, or the most interesting areas, are the ones where human beings bring a unique skill,” said Karen Harris, managing director of Bain & Co.’s Macro Trends Group who co-authored a February report which found that, by the end of the next decade, increased automation could eliminate as much as 25 percent of current U.S. jobs. Workers with jobs that require more training or hands-on work, and those with backgrounds in more creative fields, such as new product invention and development, will be more successful moving forward, with automation likely making it easier for people to launch their own businesses, Harris said in a Wednesday interview. Rep. John Delaney (D-Md. ), co-chair of the Artificial Intelligence Caucus, a bipartisan group dedicated to informing policymakers about AI, said the United States needs a comprehensive AI strategy to ensure the country leads the way in the research and development of transformative technologies, while also protecting workers who could be adversely impacted by increased automation. Part of the strategy “is saying this is going to be transformative as it relates to the future of work in this country, meaning it will be both disruptive to jobs and it will likely also be creative to certain jobs — meaning it will create some jobs and lose some jobs,” Delaney said in a Wednesday interview on Capitol Hill, adding that increased automation will likely lead to current unpaid occupations, such as caregivers, transitioning to paid positions in the future as a result of the shifts in workforce. The Trump administration on May 10 said it was establishing a Select Committee on Artificial Intelligence to improve the effectiveness and productivity of federal research and development efforts related to artificial intelligence. An administration official told Morning Consult that job displacement is a concern when it comes to emerging technologies, but that increased automation also comes with benefits to worker safety and efficiency. The committee is expected to host its inaugural meeting within the coming weeks, when it will set the interagency agenda of priority issues, the official said.